BREAKING NEWS UVA IS THE 2019 NCAA MEN'S BASKETBALL CHAMPIONS!!!! The Hoos start off their ACC road schedule with a W.
The No. 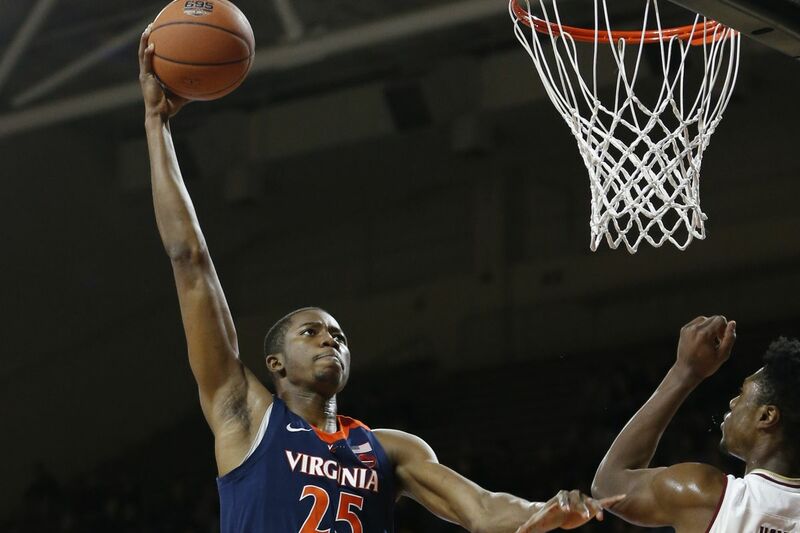 4 Virginia Cavaliers improved to 14-0 with a convincing 83-56 win over the Boston College Eagles in Chestnut Hill. The win is Virginia’s 12th straight road win and 11th straight in the ACC (going back to 2017). With No. 17 Houston losing their first game of the season at Temple earlier in the evening, Virginia and Michigan are the last two undefeated teams in the country. Four players finished in double-digits for the Hoos, led by 18 from Mamadi Diakite. He shot 9-for-12 from the field, and matched the career-high in points he set earlier this season against Coppin State. De’Andre Hunter also had 18 points, exploding for 13 of them in the second half. Hunter went 6-for-11 in the game (4-for-5 in the second half) and six rebounds and two assists. Ty Jerome added 13 points, four assists, an one steal, and Kyle Guy added 10 points, eight rebounds, five assists and two steals in the game. Jack Salt, not known for his offensive production, finished with seven points in 14 minutes. As a team, Virginia shot 60% from the field and 42% from three and turned the ball over 11 times. The Hoos dominated in the paint, outscoring BC 46-26. Defensively, Virginia had some issues giving up too many easy buckets, but they held Boston College to 39% shooting from the field and 28% from three. The Eagles turned the ball over just nine times, but Virginia dominated the boards and limited BC to just six second chance points. Nik Popovic led Boston College with 16 points, followed closely by Ky Bowman with 15. Jack Salt got the Hoos on the board first, connecting on a jumper in the paint. Boston College took the lead on a three pointer from Bowman before Diakite answered with a layup. Another three pointer from Bowman put the Eagles up by two, but Guy picked up where he left off last game and canned his first three point attempt of the game to put the Hoos in front 7-6. Chatman got in on the three-point action with one of his own to put BC up once again. Diakite traded buckets with Wynston Tabbs and Nik Popovic as he scored three straight for the Hoos, and Jerome hit his first three of the game to give Virginia a 16-13 lead with 13:17 to play. Guy came up with the block on one end, then called his own number on a difficult take through contact on the other end to put Virginia up five. Chatman found Popovic for an easy layup to cut Virginia’s lead to three. On Virginia’s next possession, Guy passed up an open three to find a wide-open Jerome for the 21-15 lead. Chatman and Diakite traded layups before Popovic connected on a hook to make it a four point game with 8:52 remaining in the half. Hunter got on the board with a three pointer from the corner that rattled around before falling through, the followed his own miss on the next possession for the layup and the nine point advantage. Bowman took Clark on the drive and got the Eagles back within seven. Back-to-back misses by Virginia gave BC a chance to close the gap further, and Jairus Hamilton obliged with a tough shot over Braxton Key’s extended hand. Guy returned Virginia’s lead to eight with his second three of the half with 5:42 to play. Key converted the old-fashioned three-point play to give the Hoos an 11-point lead at 34-23. Diakite added to it with a monstrous dunk off of an in-bounds play, but BC closed within 10 again after a three from Chris Herren Jr. Jerome answered with a made free throw and a layup on back-to-back possessions before Popovic got a layup in the paint to make it 39-28 with 1:26 left in the half. Boston College left Diakite all alone to slip the defense for a wide-open dunk yet again to give Virginia a 13 point lead. Bowman’s third three of the half closed the gap a little, but Jerome called his own number with seven seconds left for the last score of the half. Virginia would take a 43-31 lead into the break, led by Diakite’s 14 points. Jerome added 11 of his own to go with three assists, and Guy had eight on 3-for-5 shooting. The Hoos shot 56% from the field and 46% from three in the half, and corralled six offensive rebounds that led to 10 second chance points. Virginia took advantage of the BC defense, scoring 24 points in the paint in the first 20 minutes. Boston College shot 45% from the floor and 36% from three, led by Bowman’s 11 first half points on 3-for-4 shooting from beyond the arc. The Eagles only turned the ball over five times, leading to five points for the Hoos. The Eagles got off to a quick start in the second half, scoring the first five points before Key drove the lane and spun for a finish at the rim to put Virginia back up by nine at 45-36. Popovic hit a three, closing BC back within six with 16:34 to play, but Hunter responded with his second triple of the game to give the Hoos a little more breathing room once again. Virginia struggled to get good looks at the zone BC rolled out to start the second half, but got more comfortable after about four minutes. Guy connected from the middle of the zone at the free throw line to give Virginia a double-digit lead once again. After the Eagles missed a layup on the next possession, Clark found Salt in the paint with a bounce pass. Salt made a move, blocking his defender out with the basket, and finished with the layup to give the Hoos a 54-41 advantage with 12:32 to play. Hunter extended Virginia’s lead to 15, and Salt added to it with a hook on their next possession. Key blocked a shot by Chatman, and Guy found him in transition to continue the Hoos offensive burst. A Diakite layup and two free throws from Hunter made it 64-41 with 8:33 to play as the defense stifled everything that the Eagles tried. Bowman ended a 16-0 Virginia run and a 7:17 Boston College scoring drought with a three pointer from the top of the arc with 7:49 to play. Diakite tied his career-high in points with another uncontested dunk before Tabbs made one of two at the free throw line on the other end. Hunter made a big-time move to the basket and finished through contact to give the Hoos a 23-point advantage. He made the free throw to make it 69-46 with 6:46 to play. Bowman made one of two, but BC rebounded the miss and Chatman was able to connect on a jumper. Salt was fouled after rebounding a miss from Guy and the Kiwi big man made one of the two. Hunter went back to the line, joining the crowd and making one of two. Key slammed home a monstrous dunk with 4:44 to play as the Hoos easily had their way on both ends of the court. Two free throws from Jerome and Jay Huff connected on a three before Popovic followed his own miss for a dunk. Huff returned the favor with a dunk of his own, and the cheers of “let’s go Wahoos” rained down on the players from the Virginia faithful in attendance. Next up, Virginia plays at Clemson at noon on Saturday. The game will be televised on Raycom Sports. Kyle Guy will not withdraw from the NBA Draft In a tweet, Guy says thanks, and goodbye.